There is nothing more satisfying than a bike which is smooth, silent, and works well! One major component to a good feeling bike is the gears. Here is a full tutorial from start to finish on how to adjust your bike gears like a professional! Some of the following tips I have picked through my experience, and will hopefully help you too! Gears come in a range of qualities, sizes, shapes, and types. However they all follow the same basic principles. The following article will cover gear cables, derailleur alignment, problem troubleshooting, and maintaining the shifting quality from here on out! But first, it is always easier and more pleasant with a clean bike. For a professional guide to cleaning your bike, please read our article on ‘how to properly wash your bike’, then come back! Begin at the shifter, start clicking the gears right down to the smallest chainring (highest gear). Once done, go down to the rear derailleur and look at the little Allen bolt which is pinching the end of the cable. This needs to be released by undoing the Allen bolt. Note: Only unscrew the Allen bolt enough to release the cable. Once cable is free, remove the cable from the bolt (taking note of how it came out). Pro Tip: Once the cable is loose, pinch the end of the cable with your left hand. Pulling with a little bit of tension, use your right hand to hold the shifter. Shift up and down the gears, maintaining tension on the cable. If the cable moves freely through the cable hose, then you shouldn’t need to replace the cable or hose (skip to step 3). If it has trouble shifting back out of the hose, keep reading. If you need new cables or cable hosing; Depending on the quality of the end of your cable, you may need to snip the frayed end off the cable. Do so, then go up to the shifter and look for the other end of the cable. To find out how to get to the opposite end of the cable, search the shifter model in Google or YouTube. It should look something as seen along side. 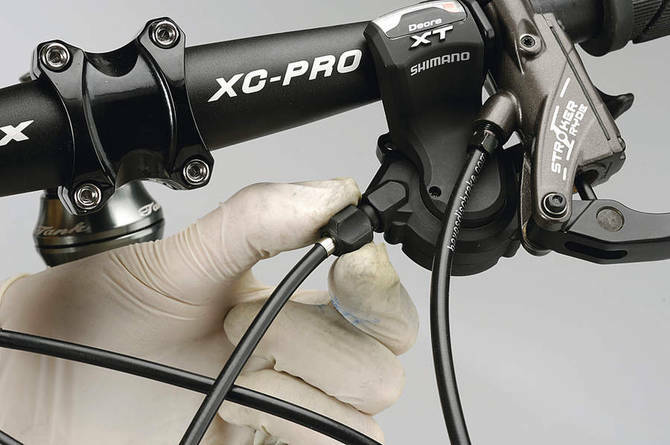 Generally on Shimano it will be hiding behind a small plastic screw. Pro Tip: To extract the cable, pull the plastic hosing near the shifter away from the shifter, to expose the cable entering the shifter. You should be able to push it through from there. Once the cable has been extracted, replace with new cable. Do this by feeding the cable through the small hole in the shifter where it came from. Once the cable has gone through the shifter, feed it the rest of the way through the cable hose. Pro Tip: If the cable wont go through different folds/gaps in the hosing, softly pull and push it without too much force. Sometimes you need to pull off the small end caps from the hosing, and feed the cable through by hand. Now pull from the bottom of the cable, to make sure the bead at the top of the cable is properly seated. Then seal up the shifter, and your cable is installed! Now that the cable is sorted, stand behind the derailleur, and spin the cranks to watch the chain roll. Make sure the jockey wheels sit directly under the smallest chainring (as seem alongside). If not, we need to set the high limitation screw tighter or looser. Begin by locating the L and H screw. They should be on the body of the rear derailleur (labelled with a H for high gear and L for low gear). If the chain sits towards the next biggest chainring, screw the H screw anti-clockwise. Stop once chain is sitting below the small chainring. If it is sitting closer to the outside of the bike, screw the H screw clockwise. Stop once chain is sitting below the small chainring. Now that this is set, hold the body of the derailleur with your left hand. Holding the pedal with your right hand, begin to pedal the bike. As the bike is pedalling, push the derailleur up to the largest chainring. Now stop pedalling, and wait for the wheel to stop (while still holding the derailleur up). Like before, check that the jockey wheels sit directly under the largest chainring. If the jockey wheels are too far towards the wheel, screw the L screw clockwise. Stop once it sits directly below the large chainring. Likewise, if it is too close to the smaller chainring, screw the L screw anti-clockwise. Now that your limiting screws are set, begin to pedal the bike with your hand again. Slowly release the derailleur to the smaller chainring. With the limiting screws set, and new cable installed, it’s time to tension the cable! Begin by going up to the shifter. There should be a metal or plastic knob (barrel adjuster), This is what tightens or loosens the cable. It should look something like the picture to the right. Twist that clockwise, until it stops. Then give it one full turn anti-clockwise. Now going back down to the derailleur, there should be a similar looking barrel adjuster. Note: Not all models have a second adjuster. If your model has this barrel adjuster, do the same as you did to the shifter. Now with one hand pull the end of the cable with a reasonable amount of tension (ensuring that the shifter is shifted all the way down), and with the other hand, take the same Allen key you used to loosen the cable. While holding the tension on the end of the cable, place the end of the cable back through the bolt and tighten the bolt reasonably tight. Pro Tip: Over tightening the bolt can cause the cable to fray. Don’t over tighten it, only with a medium amount of force. Now with the cable tightened back to the derailleur, begin shifting through the gears. If the gears struggle to go up through the range to the bigger chainrings, twist the barrel adjuster at the rear (if applicable) anti-clockwise. Pro Tip: Only make small adjustments to the barrel adjuster knob, as it doesn’t take much to start working. Once the derailleur moves smoothly through the gears, take an end cap, and secure it over the end of the cable. Now that your gears are looking good, time to do the front gears! The front gears can be a bit more tricky, but are less often ‘out of alignment’. Begin by shifting the rear gear to the middle of the cassette (gear range), then the front into the smallest ring. Now unclamp the cable at the front from the Allen bolt. Again testing the cable, unwind the cable from the clamp, pull on the end with one hand, and shift through the gears with the other, maintaining tension on the cable. If it needs replacing, follow the same steps as you did with the rear. If it feels smooth, move on to step 6. To begin setting the limits on the front, shift the rear derailleur to the largest chainring (lowest gear), while leaving the front on the smallest ring. Looking at both the screws on the top of the front derailleur, begin turning the screw marked L on the front derailleur clock-wise, until the cage hits the chain, then back it off, leaving about 1mm between the chain and the derailleur cage. Pro Tip: If the screw is hard to turn, manually flex the derailleur by hand outward, and turn the screw with the other hand. This takes the tension off the screw, making it easier to turn. Going up to the handlebars, rotate the barrel adjuster on the front gear shifter as before (clockwise until stops. Anti-clockwise one turn). Now take the end of the cable, back at the front derailleur, holding tension on the end of it, and thread it back through the Allen bolt. Shift the rear gears into the smallest chainring. and shift up the front gears into the biggest chainring using the shifters. If it struggles to go up the front chainrings, add tension to the cable by rotating the barrel adjuster anti-clockwise. Once the chain is in the biggest chainring at the front, and the smallest at the rear, its time to set the H limit screw. Looking from above, begin pedalling the bike cranks slowly, keeping tension on the chain. As you do so, screw the H screw clockwise until it is just tapping the chain, then back it off about 1mm-2mm anti-clockwise so there is no rub. Once it is clear of the chain, you should be all set, and ready for the last step! 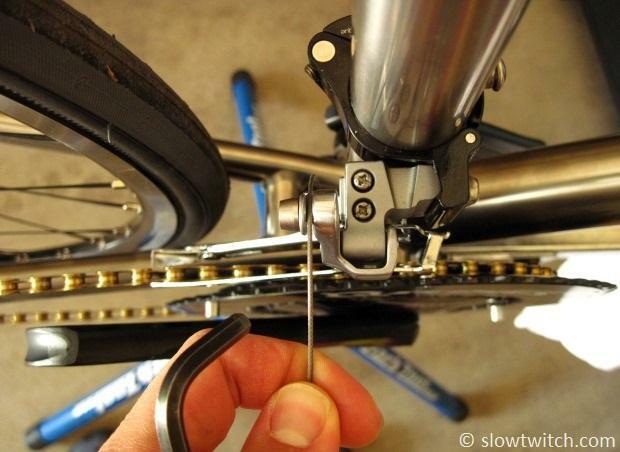 Finally, let’s adjust the cable tension at the front, to finish off your almost perfect gears! Rotating the cranks again, shift the rear gears to the middle chainring. Now begin shifting up and down the front chainrings, while still pedalling the bike cranks. If the front is struggling to shift down the rings, screw the matching barrel adjuster clockwise. Like wise, if it is struggling to shift up, screw the barrel anti-clockwise. Pro Tip: Once it is all working smoothly, take the bike for a test spin. Sometimes under pressure, the gears may not work quiet as smooth. While out testing, make fine adjustments at the shifter barrel adjusters to fine tune. With all gears working smoothly, its time to ride! 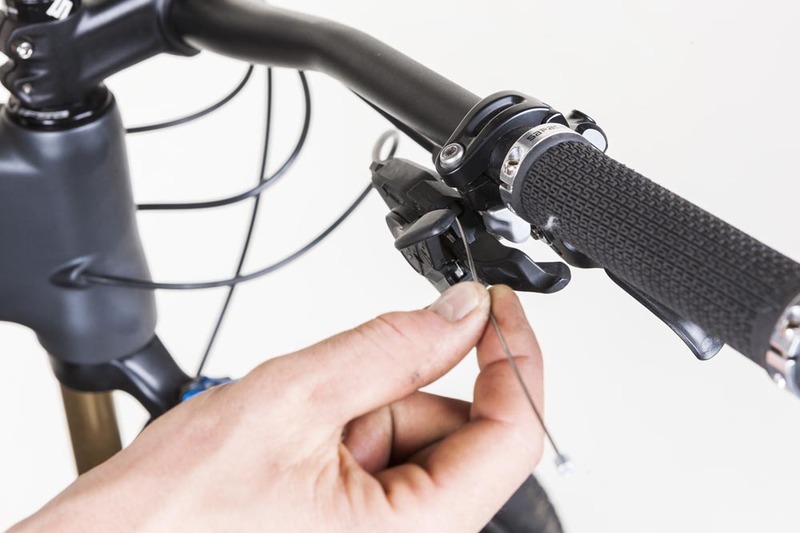 If there is still something not quiet right, read through the following checklist to work out how to troubleshoot some of your shifting issues. If you need a place to ride around Adelaide, click here to check out our top ranked downhill/mountain bike trails. The likelihood of an issue like this is a bent hanger. This is the metal piece between the frame and the derailleur at the rear. This can be bent back into place with the correct hanger alignment tool, or replaced for around $30 at most bike shops. Other potential reasons may include worn cassette, derailleur is old and ceased/bent, spring is rusted/old, worn chain, wrong derailleur for the cassette you have, or old cables which need replacing. This is almost always due to the limit screws not being set right. If they have however been set right, you may have too long of a chain, or worn parts such as chain, cassette or derailleur. This is almost always due to a poorly tensioned cable. Read steps 4 for the rear derailleur, or 7 for the front derailleur. Another reason can be when a component to the drivetrain is replaced, without replacing another part. For example, replacing the chain, without replacing the cassette. Components wear into each other, and when one is replaced, it is not yet worn in. Try replacing all components at once, or else buying 3 chains at a time, and rotating through them to wear them all in at a similar rate. Sometimes derailleurs become frail, or bent. Some pivots may seize and become less functional. The best bet is to replace the derailler. Consider going through Chain Reaction Cycles, with their massive range, and great customer service! Still have questions? Shoot us an email, and we’ll be more than happy to help you out!